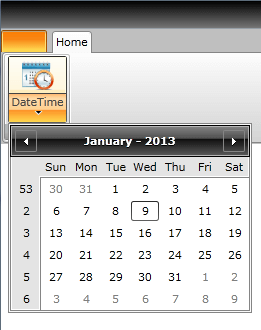 The purpose of this tutorial is to show you how to integrate a RadCalendar with a RadRibbonView. 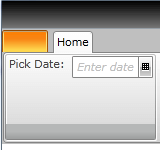 The solution is to set the RadCalendar as a drop down content of a RadRibbonSplitButton. The next example demonstrates how to do that. Except the controls associated with the RadRibbonView, like RadRibbonButton, RadRibbonGallery, RadRibbonComboBox, you can place other controls in the RadRibbonGroups. Here is an example of adding a RadDatePicker control inside a RadRibbonGroup. 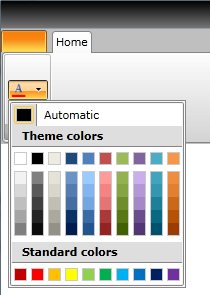 The next example demonstrates how to integrate a RadColorPicker directly into a Ribbon Group. 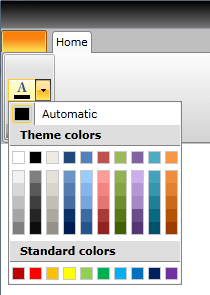 Integrating a RadColorSelector with a RadRibbonDropDownButton is a simple task. See the next code-snippet. The RadColorSelector is set as a DropDownContent of the RadRibbonDropDownButton.